1923 | Out of the Box! After 18 years as the Sam Houston State University Archivist, there are very few things that will make me go, “WHOA”, anymore. But today with the turn of a page from a ledger of 1923-1937 faculty meeting minutes, the answer to one of my top five unanswered questions about Sam Houston State University history was revealed. How and when did Sam Houston State University adopt the school colors of orange and white? 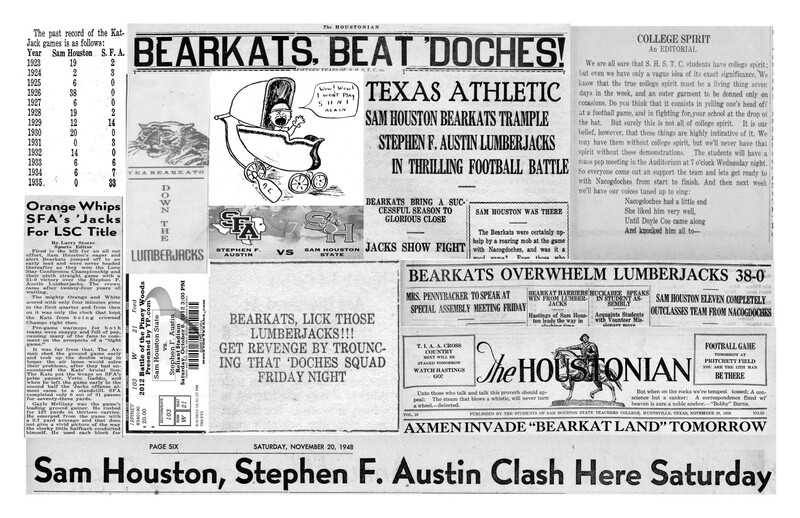 Today’s BearKats know our University colors as orange and white, but that hasn’t always been the case. Prior to early 1924 the colors of our school were yellow and white. Back then, we were the Sam Houston Normal Institute, “Normals”. When in early 1923 the Sam Houston Normal Institute changed names to the Sam Houston State Teachers College (SHSTC) it was decided by President Harry F. Estill and the Athletic Council that a change of school colors was in order. In the SHSTC faculty meeting of December 13, 1923, the matter of school color was brought up by Mr. Earl Huffor, Professor of English, who recommended the colors of orange and white. Since the matter was supposed to be handled by the Athletic Council, the faculty decided to appoint their own special committee members to assist the Athletic Council with the problem. 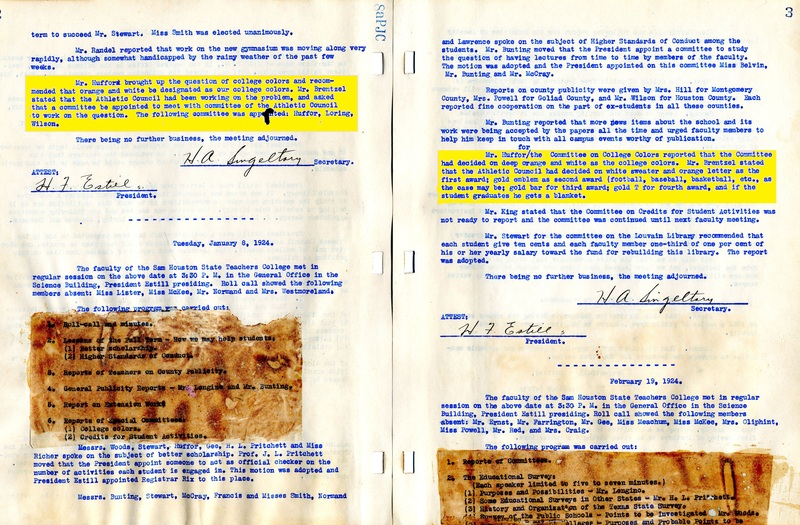 It was decided that Mr. Earl Huffor, Professor of English, Miss Anna Loring, Professor of Art, and S. C. Wilson, Professor of Agricultural Education would be the Color Committee members. So the College went on Christmas break and the matter was left to be decided in January of 1924. In the next faculty meeting January 8, 1924 the matter of the College’s colors was brought up again and Mr. Huffor, speaking for the Color Committee, reported that the committee had decided on deep orange and white as the College colors. And so as they say, history was made that day. Ninety years have gone by for the colors of ole’ orange and white so rest easy Professor Huffor the colors you picked were just BearKat right. To see the original 1923-1937 SHSTC Faculty Meeting Minutes ledger the above image is from, come visit the University Archives, Newton Gresham Library, Room 400, M-F, 8-5.